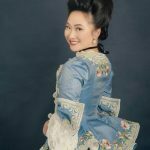 A few months ago, I ran into an article on The Costume Rag about a frock coat and suit at the Victoria and Albert Museum. I fell HARD for it.You can see pictures of it at two places for the most part – the actual Museum site, and fans who go and take pictures of it. The museum site has the best resolution but the fans pick up the details. Like a mysterious pocket on the right pocket. Like the details on the back. I myself plan on doing a sojourn to London this coming May/June to see this in person. 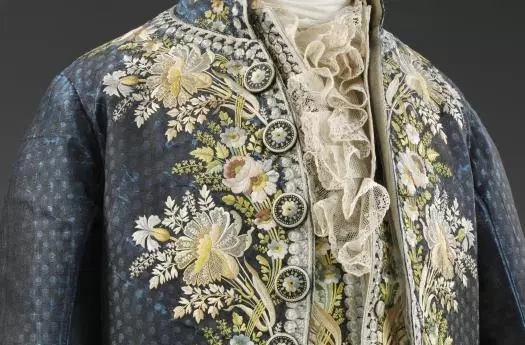 But for now, I wish to recreate it for my husband to wear to the Versailles ball. Because let’s face it – it’s GORGEOUS. So I went to work digitizing. I could go into the details of how, but I’m not particularly good at digitizing myself, nor am I an efficient one. However, my artistic better half, Cari from Cabbit Corner was busy with a combination of life and a GIANT stack of commissions, so I decided to tackle it myself. As you can see, there are a LOT of different parts to this design. I actually made myself a to-digitize list and broke it down into separate parts depending on how long I thought each part would take. I put it in an Erin Condren book to be pretty. So after all that I was able to finally print the first OFFICIAL piece of my coat – a cuff. I was happy with it. ? You’ll of course notice the antique silk organza applique. For the VERY heavily embroidered areas in the front, I used linen buckram, reinforced with gum arabic and blind stitched it to the front. I the covered it with the linen to it wouldn’t be seen. But this prevented some unfortunate buckling in the embroidery- an issue I had with ALL my frock coats to date. ? It seemed to work but I’ll let you judge for yourself at the end of this article. I even added the SECRET pocket on the right side of the coat. I first noticed it after it was pointed out by Pinsent Tailoring on the 18th century sewing group, and wanted it for Matt. I used some heavy handed button hole stitches to make it for Matt as well. His will hold a secret little locket, made for me by Queen and Cavendish, filled with a picture of me (drawn by @belindal.illustrates ). I really do wonder what marvelous little secrets that original pocket held. Love letters? Historic goat intestine condoms? Snuff? I really do hope it wasn’t snuff and something a little more fun in nature. As for the breeches straps, I made it as close to the original as possible. That being said, I noticed the design didn’t print well much smaller than it was, so I made the straps 1.25″ instead of the pattern’s recommended 1″. I didn’t think much of it at the time, but once I was done, I realized my error. Almost all breeches buckles on the market are designed for 1″ straps, and due to the embroidery, the straps didn’t fold very well. I ended up buying two neck stock buckles to compensate, though I may get actual breeches straps now that I found some. ? As for his shirt, I made him a hand sewn shirt complete with THE STITCH (per the pattern by Larkin and Smith) about a year ago so we decided to rewear that. Please note my beloved gathers at his wrist. ?